This newly released hidden object adventure game is one of the games that can be used as an example of a great game of this genre. 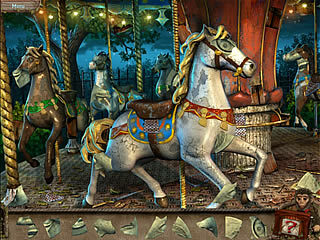 Weird Park: Broken Tune is a horror story presented in a form of puzzles and searches. You play as a detective who was asked to investigate the case of a missing journalist. One of the things that you will notice right away is the quality of the audio-visual part of the game. The graphics are absolutely beautiful and detailed with the colors that help your eyes enjoy the game. The major story is voiced and told in stead of written to you, which is always a great thing. You play as a detective who was asked to investigate the case of a missing journalist. The last time he was seen was at an entertainment park. As you arrive to the place you realize that there is much more to investigate than just what happened with the jounalist. The game features the major typical kinds of activity of this genre. You will do a lot of going back and forth searching for active areas and inventory to use in order to proceed. 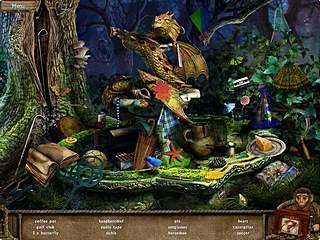 There is a decent number of hidden object scenes to search through. They come in different forms making it less boring. Then there are also different mini-games. They are all the same that you layed in the games before, but they are still fun to try and solve. Even if you don't enjoy the small puzzles you can skip them pretty soon. All in all the game seems to be a really nice way to kill afew hours. This is Weird Park: Broken Tune review. Download this game here.